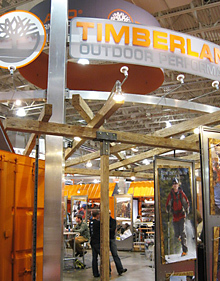 Aluminum Supply Company provided a number of large ¼” thick vertical aluminum columns that defined the interior of Timberland’s entry at the Outdoor Retailer Winter Market 2007. ASCO also supplied the 6” square aluminum tubes that were used to create the large ring that intersects with the columns. The custom aluminum columns required some creative fabrication techniques to produce the deep, narrow profile. It was especially difficult due to the	required ¼” plate thickness. These columns were produced in only two days. 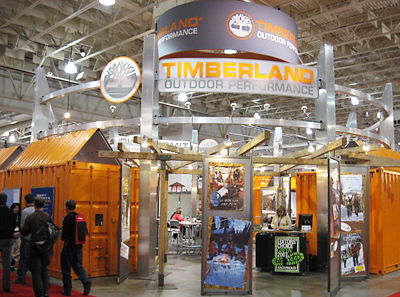 This impressive display took the SNEWS “Top BOB” award at the show.